Ok, I'll admit. I'm a little helmet-hair obsessed. But when you're an American girl living in Roma, Italy - it really is necessary to care about your hair. 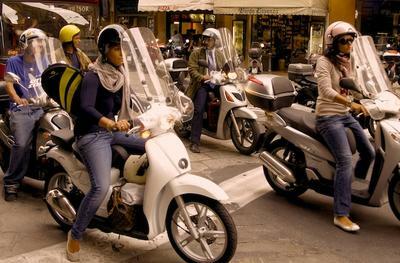 Have pity on me: I am surrounded by gorgeous Italian girls who take off their scooter helmets and look fabulous every time...or so it seems to me. It's easy to feel dowdy around these ladies!!! When I first moved here to work for a furniture company, I pretty much tore my (hair?) out every day trying to keep my own mane in control, AND look human when I arrived to work. So, I really had to think about how I wore my hair, and how I wore my helmet if I wanted to embrace the European way of life. Although not related to hair: my first task was to ditch the Nike shoes, toss out the sloppy jerseys and jeans I used to wear when riding my motorcycle around my hood in Texas. These 'casual' clothes simply DO NOT CUT IT in Italy! Too casual, too sloppy, too ...blah. On the back of the scooter - I had to get a few things right: A nice jacket or cape in winter, a good but short neck scarf, and quality boots -- designer ones, not head-kickers! Or flats in summer. With that out of the way, I was nearly there...but then the DREADED HELMET HAIR. Oh no. All my plans for a stylish way to fit into Roma were thwarted for the first 6 weeks when I had nothing but soggy shoulder-length hair from the humidity of Fall this year. FIRST, I decided to re-fit my helmet and find one that fit me 'not as tight'. My first locally bought brand was just too squeezy on my sides...and probably helped flatten my locks just a bit too much! When I found a new helmet, it had just enough give to be firm and safe, without pressing on my brains and ears so much! Wow, helmet choice...a whole OTHER journey! THEN, I make sure I used my AIRHEAD - it's very cool helmet liner which I discovered online around May this year. Summer was coming, and I was getting desperate about the heat! It arrived about 10 days later and I fitted it to my second helmet. It has worked for me. I have fine hair which is flattened easily in the heat. The Airhead definitely allows just a touch of air in there...enough so that when I take off my helmet I'm not so sweaty and gross. AND the little soft silicone bumps kind of 'fluff' up my hair ! It took some getting used to but now I really like it. If you keep it away from your forehead and move it ever so slightly across the top of your helmet towards the rear, it really works well. AND, it helped that my helmet wasn't too tight and had some space to accommodate the new liner. I really recommend Airhead girls! I live in Europe and only just got hold of one of these. I think Astrid is right, it is working well on my hair and the people delivering in Europe are very helpful. Definitely use Airhead, Astrid is right - you just have to care about your hair to get the style right and the fit. I don't know about those people waaaaay back in February complaining about delivery, but I had no problems. They should take those posts down - totally irrelevant now! Flats and heels, they can do it all! Agree Carissa, takes a bit of getting used to my flats on a motoscooter. But look at the girls in my picture? Such panache! Some women are riding in heels...I have to practice walking in them first! I like Airhead too but....flats on a motorcycle?